My wife Sunita is leaving soon for an extended performing and teaching tour in the USA, so we decided to take a weekend off and spend some time together. For some time I had been wanting to visit the village of Al Aqaba in the north-eastern West Bank, and since they recently opened a hostel there, it seemed like a good destination. We also planned a stop in Tubas to pick up some Camel's Milk soap, and a visit to one of my wife's harp students in the village of Salem. So off we went . . . .
After leaving our home in Kfar Saba, just north-east of Tel Aviv, we entered the West Bank through the Kalkiliya checkpoint and drove to Nablus to pick up my friend Majde who would accompany us on the drive north. Majde is an amazing man who knows everyone in Nablus and is deeply involved in developing Palestinian society, including work with the Labor Union, Palestine People's Party, and organisations at the Balata Refugee camp. He was useful to have on this trip since I hadn't driven through the area north of Nablus for a couple of years. 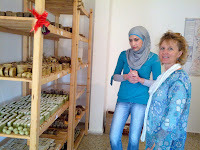 Majde also guides the Green Olive Nablus Tour. After picking up Majde at Balata Refugee Camp, he helped us navigate the roads out of town and back to the main road north. The scenery is quite spectacular north-east of Nablus, and we passed ever-steeper hillsides, the result of massive earth-shifting at this edge of the rift valley which stretches from the Sea of Galilee to the Red Sea. Periodically there are earthquakes which alter the local topography, in this case creating hillsides that approach the vertical, while retaining just enough topsoil to support a green veneer to supply some fodder for the ubiquitous goats, and the local wild hogs. As the hills flattened a bit we passed through the village of Ain al-Beida, renowned for its ancient springs and a tourist destination for Palestinian families. With no time to stop there, Sunita and I decided to visit on the return trip the following day. 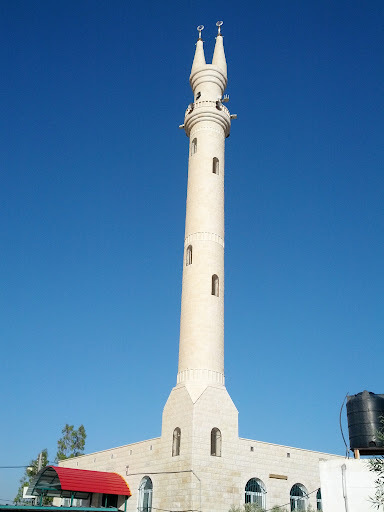 Another 20-minute drive brought us to Tubas, a town of over 16,000 Palestinians, and home of the Japanese air organisation, NICCOD, which initiates sustainable development projects around northern Palestine. Although their office was not open on saturdays, we decided to track them down in order to return the next day to buy some soap. This is where Majde came in handy. A few questions to locals on the street brought us down some back alleys to a small office building which would be easy to find again. Tubas seems to be a well organised town with some new construction and a bus sling commercial main street. Not a tourist in sight. We were definitely way off the beaten track. We drove off to the north and the hills kept flattening as they approached the steep decline into the Jordan Valley, more than 1,000 meters below. In no time at all we were at the entrance to Al Aqaba. the difference was quite stark from the previous villages. The streets are well kept and clean. Short whitewashed walls line the road and marked off the private plots and homes. Well maintained sidewalks line the streets, and the dominant architectural feature is the village mosque, with its unique forked cap on the minaret - emulating the V for victory hand signal we were told later. When we pulled up at the guest house our host Haj Sami Sadeq was there to greet us with his warm smile. 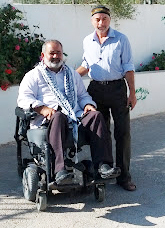 Haj Sami is the mayor of Al Aqaba, and has been confined to a wheelchair since being accidentally shot by Israeli soldiers during an army training exercise. After Majde took his leave of us, we settled into the comfortable hostel as the only guests that night. It is sometimes full when groups come to visit, or when volunteers stay there and teach English to local students. There is high speed wireless internet, modern bathrooms, and a spacious lounge and kitchen for cooking meals and relaxing. Since it was late afternoon we took a nice 35-minute walk back to a neighbouring village to find food for dinner - fresh felafel, hummus, and fruit from a local vendor. After dinner, as dusk fell, we took another walk with Haj Sami, and in between viewing the beautiful landscape we learned about the tragedies of the Al Aqaba. Situated in the middle of a military zone, the villagers are forbidden from building new homes as their families grow and children are married. These villages usually grow organically with new homes added to the edge of the existing built up area. The state of Israel has placed demolition orders on many recently built homes and the villagers live in constant fear that the bulldozers will show up any day. One organisation that has been helping with this situation is the Rebuilding Alliance, a US-based NGO that raises money to fund new homes with mortgages insured against demolitions. We saw three new homes being built that were funded by the Rebuilding Alliance. Waking up at 5am to the sounds of the birds singing and the goats bleating was truly unforgettable. As the rays of the morning sun stretched over the Jordanian hills to the east, the surrounding hills and village architechture was displayed in sharp relief, it was hard to believe that all this was just an hour and a half drive from Tel Aviv, across the veil of the Occupation and another world altogether. After breakfast we toured the tea-bag workshop, funded by the Japanese government. Taking the indigenous mint, sage, and thyme plants, the workshop processes them using modern scaled down machinery, and produces tea bags smartly packaged into colourful cardboard boxes ready for the shelves of shops and supermarkets around the West Bank. I couldn't help but thinking that such projects helped local people much more than the grand infrastructure funding more commonly seen. 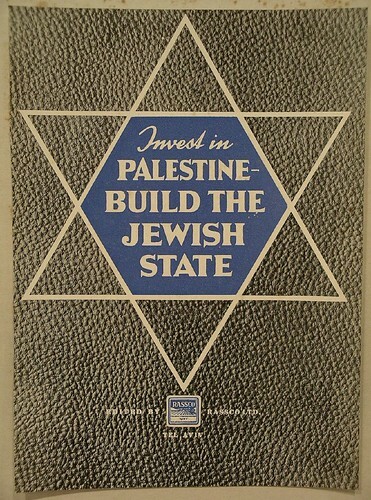 With the unemployment rate more than 60%, Palestine need a helping hand up, not a hand out, not welfare from abroad. 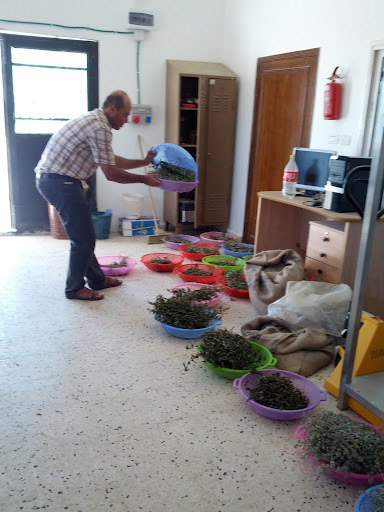 Projects such as the tea-bag workshop provide sustainable employment and keep the donor funds recirculating in local economies, rather than lining the pockets of the big Palestinian contractors who are the main beneficiaries of US-AID and similar government-driven programs. We said our goodbyes and backtracked along the route of the previous day. In Tubas we went to the NICCOD office where Saafa, the Project Coordinator was more than happy to sell Sunita 20 cakes of the Olive Oil Soap blended with camel's milk. Sunita will be taking the soap to the USA as gifts on her tour. 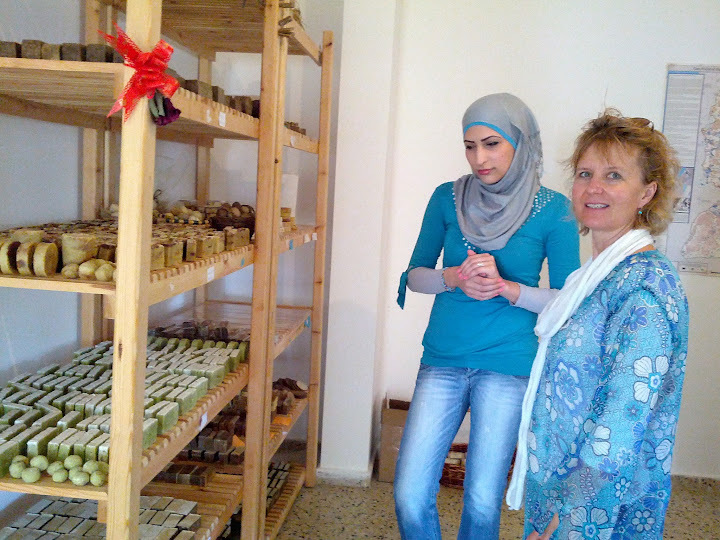 The soap-making project currently employs six local women and current sales are primarily at Palestinian fairs and festivals. Another useful project designed to stimulate employment and sustainable development. 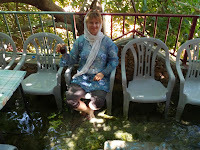 We made one other stop before Nablus in Ain al-Beida, where we viewed some of the springs adjacent to the main road. One enterprising restaurant built terraces up the hillside and channels for the cascading water. We has a cup of tea on one of the terraces where we were able to sit at a table with the water flowing through our feet. Very refreshing. The only disappointment was the outrageous price for our tea - 10 shekels ($2.50) each. Ah well, we were tourists after all. The final visit was in Salem, a small village due east of Nablus where Yasmin, a blind Palestinian woman, learns the harp from Sunita. 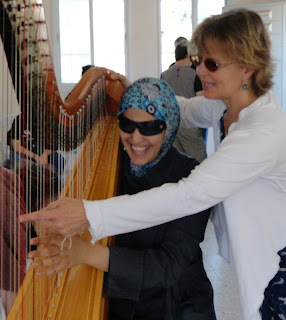 Due to the generosity of dozens of people around the world we were able to purchase a harp for Yasmin. 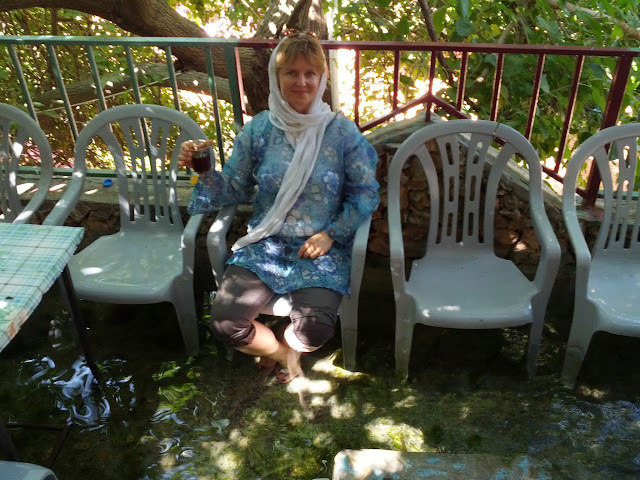 Having tea at the spring. Sunita visits every week to give a lesson. Although I had been to visit the family before, this was my first visit on a harp lesson day. Usually it's a women-only event as Yasmin's mother, sisters and friends come round for a social gathering with 'The Israeli Harp Teacher'. The doors are closed, the headscarves come off, and the ladies let their hair down without men around to bother them with their demands and their conservative notions about what is 'proper' for women. On this day however, since I was with Sunita, the headgear was worn, and proprieties had to be observed. Yasmin's brothers were also in attendance, and when they had to go off on an errand in thecae, I was expected to go along since an unrelated man could not be left alone at the house with the women. We did have a family lunch, with all of us on the floor, sitting at the edge of the spread tablecloth, eating delicious hummus, egg, lamb bits, luffa (large flat bread), and all washed down with delicious mint tea. Alas our getaway weekend ended all too soon. 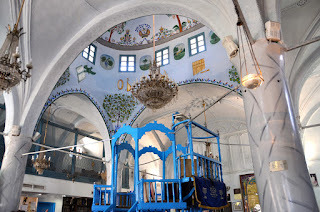 We left our friends at Salem and re-entered the Israeli bubble, just 40 minutes away, where the majority of the population have no idea about Palestinian Arab society - the warm friendly people - the rich culture and heritage - and the real desire for freedom and a genuine peace. One day - Insha'allah. What a wonderful way to spend a weekend! Fred, you are not only a wonderful tour guide but also a very eloquent writer! Thanks for sharing the highlights of your journey. Laurie and I have (sadly)left Amman and are now back in Minneapolis; hope we can get back and do some more Green Olive tours with you in the future.